Lewis County is a county located in the U.S. state of Tennessee. As of the 2010 census, the population was 12,161. Its county seat is Hohenwald. 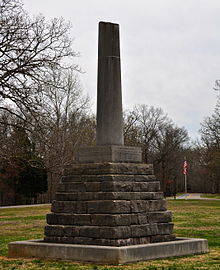 The county is named for explorer Meriwether Lewis, who died and was buried at Grinder's Stand near Hohenwald in 1809. Meriwether Lewis National Monument and Gravesite, April 2014. Lewis County was the site of the Cane Creek Massacre. As of the census  of 2000, there were 11,367 people, 4,381 households, and 3,215 families residing in the county. The population density was 40 people per square mile (16/km²). There were 4,821 housing units at an average density of 17 per square mile (7/km²). The racial makeup of the county was 97.07% White, 1.45% Black or African American, 0.20% Native American, 0.18% Asian, 0.29% from other races, and 0.80% from two or more races. 1.20% of the population were Hispanic or Latino of any race. There were 4,381 households out of which 33.20% had children under the age of 18 living with them, 58.90% were married couples living together, 10.70% had a female householder with no husband present, and 26.60% were non-families. 23.50% of all households were made up of individuals and 10.60% had someone living alone who was 65 years of age or older. The average household size was 2.54 and the average family size was 2.98. In the county, the population was spread out with 25.80% under the age of 18, 8.30% from 18 to 24, 27.40% from 25 to 44, 24.80% from 45 to 64, and 13.60% who were 65 years of age or older. The median age was 37 years. For every 100 females there were 96.90 males. For every 100 females age 18 and over, there were 91.80 males. The median income for a household in the county was $30,444, and the median income for a family was $35,972. Males had a median income of $27,060 versus $19,847 for females. The per capita income for the county was $14,664. About 10.30% of families and 13.40% of the population were below the poverty line, including 16.60% of those under age 18 and 12.20% of those age 65 or over. ^ a b Marjorie Graves, " Lewis County," Tennessee Encyclopedia of History and Culture. Retrieved: 21 October 2013. ^ White, John A. (June 26, 1910). "Lewis. Awful Tragedy Connected With Name of the County". The Tennessean. p. 30. Retrieved September 28, 2016 – via Newspapers.com. (Registration required (help)). The bill creating the County of Lewis was introduced by the Hon. Powhatan Gordon, of Maury County, the main purpose of the bill being to perpetuate the name of Lewis. ^ " First National Memorial Service for Meriwether Lewis Archived 2011-07-12 at the Wayback Machine, 21 August 2009. Retrieved: 21 October 2013. Wikimedia Commons has media related to Lewis County, Tennessee.